Starting this month, Burks Farm will be having Halal Day, for processing of goats, sheep, and beef. Halal Days at Burks Farm will be last Saturday of every month. 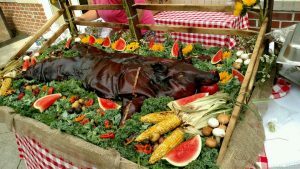 Need Help with Preparing & Cooking Your Whole Pig? Burks Farm has your solution! Preparing and cooking a whole pig can be intimidating, but we are here to help. If you purchase your whole pig from Burks Farm, Mike Chandler, David’s cousin, can prepare and/or cook your pig for you. If you are interested in our services, please use our contact form, call 804-366-2754, or email us to get more information. In the United States, Eid al-Adha or “Eids” (Feast of the Sacrifice) will be here the evening of September 12, and ends the evening of September 13. Burks Farm provides slaughtering/sacrificial services in the customary Muslim traditions.